myRESEARCHnavigators are supported through the Duke Clinical & Translational Science Award (CTSA) grant UL1TR002553. What questions are researchers asking the Navigators recently? I would like to start some retrospective research activities by analyzing data in our departmental information system which may expand to analyzing data in MaestroCare. What are the steps that I need to take to begin these activities? What training should I pursue and how does the IRB categorize this type of research? The Duke Office of Clinical Research also does free study planning consults. If you would like to schedule a consult please email docr-studyplanning@dm.duke.edu. Are there resources for new faculty researchers in setting up a lab/research webpage for recruiting new lab members and disseminating research findings? Yes! For researchers wanting to create their lab website at Duke they can go through Sites@Duke. The website is: https://oit.duke.edu/help/articles/sitesduke-creating-non-course-site and there are guidance documents here: https://sites.duke.edu/help/ (the Getting Started pdf is particularly helpful). Another great resource is Scholars@Duke which automatically makes a page for new faculty members https://scholars.duke.edu, but can be highly customized. For help on how to customize your Scholars@Duke page, follow this link to Support, or find it at the top of the page. Who's using the Navigators and How? 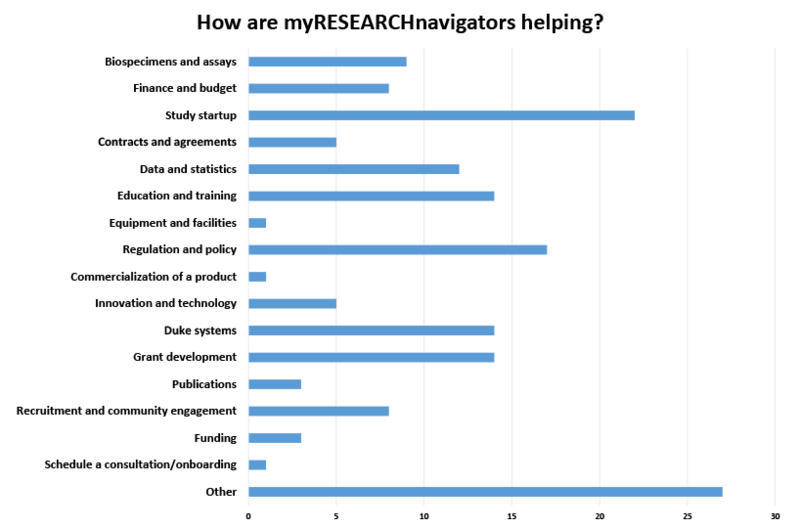 myRESEARCHnavigators are here to help you find the resources you need to keep your research flowing smoothly, no matter the topic, nor the department that you're in. Check out the list of topics we've dug into and the researchers for whom we've dug below! Help us help you and your team by getting the word out about myRESEARCHnavigators. We'd be happy to demo our services at your upcoming faculty or research group meeting. Contact us today to schedule a meeting with the Navigators today! Have a quick question about research at Duke? Spinning your wheels trying to figure something out? Contact us so we can do the digging for you!